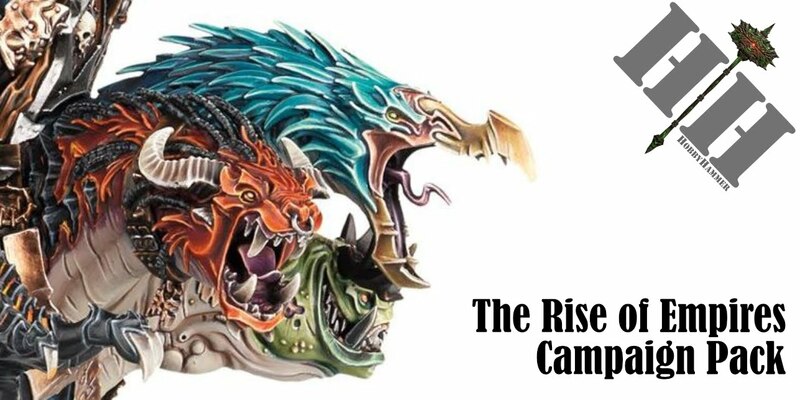 Today, I bring you something a little different, I played through the first scenario from the upcoming SCGT tournament 'Herald of the Storm', firstly I gotta say, this review is based on my opinion playing with just 2 armies, so the other possibilities are obviously endless. I also approach this review in a more narrative way rather than giving you tactics on how to play the mission, I will try and give you ammo from playing the game with a story attached. The scenario lends itself to some great narrative. 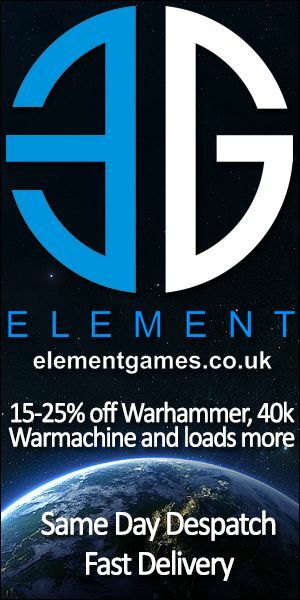 In this game between Adam James (@warhammernerd) and myself, the story was simple. The War Council formation led by Artur Sigi with their bodyguard of Fyreslayers led by Grominir, the Runefather on Magmadroth found themselves deep within the Realm of Life, travelling through some heavily overgrown landscape, in hand they had Sigmarite Hammers, sent on a mission from The Order of Sigmar to return them to Azyr. Suddenly they were ambushed by a Waystone Pathfinder formation led by a Native Nomad Prince, could they hold of long enough to secure the 4 locations on the board to open the Realmgate to travel to the next destination? 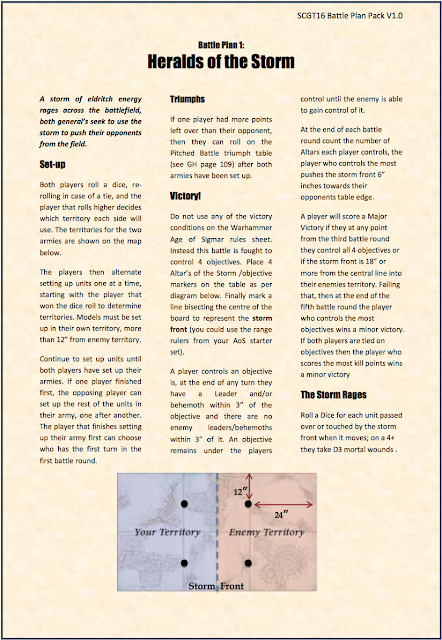 The aim of the battleplan was to secure, tag, the 4 objectives with your Leaders or Behemoths and keep them under your control, in doing so and holding more than your opponent it would push the Storm further into your enemies territory. If from the end of the third battleround the Storm was 18" from its starting line into the enemy territory you automatically win a major victory. 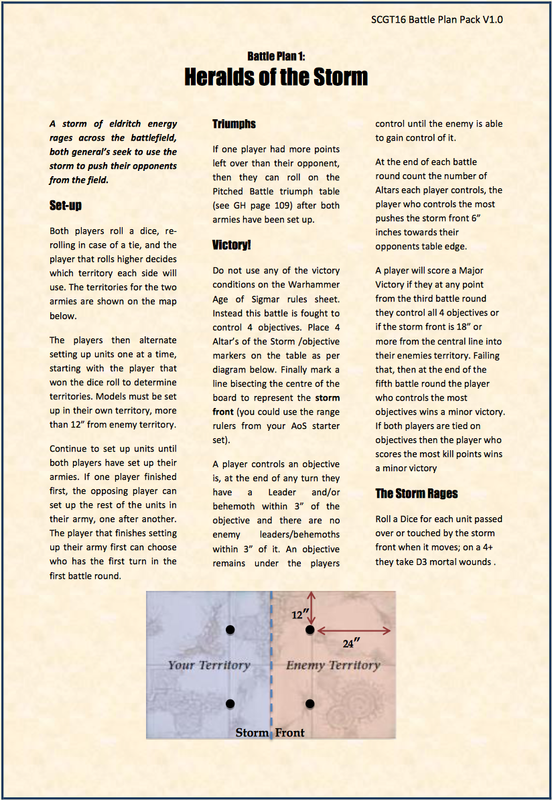 One note, unlike the Pitched Battle plans in the GHB (Generals Handbook) where you score after your own battleround, instead the scoring is done after both players have had their turn and it is is the end of the Turn. Here are the army Lists! Adam had a one drop army which in his formation allowed him to deploy off the board in ambush. In his movement phase he could set up the battalion 6" from any board edge and more than 9" away from any of my units. I then set up my whole army on the board, knowing the ambush could come from anywhere, I flanked the Bezerkers to protect the edges as much I could and set the Hearthguard up behind the main 4 Behemoths in case he come on from my back edge. Adam allowed me to go first, probably hoping for a double turn and also as he wouldn't get a first Hero phase. The War Council hurried forward, scouts had warned them of shadows in the trees ling in wait, the Chariots which held the Hammers were sent forward, The Runefather with his Vulkites moved the protect the first of the four locations, Artur on his Griffin protected the second, the Vulkites on the right flank ran forward to protect the Luminark as best they could whilst the Hearthguard moved across to give cover to Artur. The three Battlemages on foot, a Grey, A Jade and an Amber ran for the cover of the central rocky outcrop, which they later discovered to be a mystical piece of terrain. 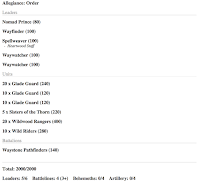 The Wanderers came from both sides, the main bulk of the army which included 30 Glade Guard, 20 Rangers, a Waywatcher, Wayfinder and The Nomad Prince himself entered the area from the bottom left closest to Artur on Griffin, now left open from the running Vulkites. The remainder of the formation which included another Waywatcher, 10 more Glade Guard, 5 Sisters of the Thorn and 10 Wild Riders entered from the top right to try and take down the Hurricanum. They were too far out though to do anything this turn. On the bottom left side though, the Glade Guard and Heroes all released their Arcane Bodkins onto Artur (who did have a Mystic Shield and LifeSurge cast upon him), this volley of arrows brought him down to just a single wound. A few more shots into the Vulkites killed off one of them. Turn 2 priority was won by me (luckily), I started my Hero phase, the Jade Wizard cast LifeSurge once again on Artur, the Grey Wizard tired to cast Miasma onto the Rangers but failed as no one helped him buff the spell. The Hurricanum helped the Amber Wizard to cast Wildform on the Runefather Grominir but still failed the spell rolling a Double 1! 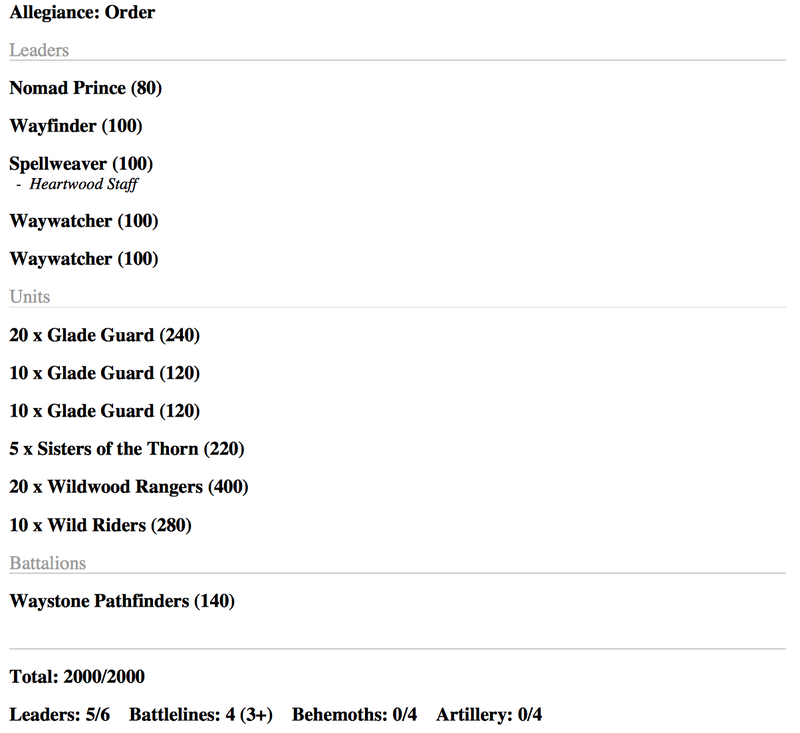 Artur saw an opportunity and threw out an Amber Spear aiming for the Glade Guard unit furthest from him, it was cast and on its way to the target went through The Rangers, Nomad Prince, Waywatcher and another unit of Glade Guard dealing Mortal Wounds along the way. D3 to each unit. The Chariots moved up again, the Luminark made it with a run to the bottom right Altar, but the Hurricanum did not make it all the way, opting not the run to allow it to shoot. The Hearthguard moved further round to the enemy including the Nomad Prince whilst Artur, knowing his time was up, positioned himself upon the wall of the ruin ready to charge the Rangers. The Runefather and his Vulkite moved up closer to the swamp. In the shooting phase the Hurricanum let lose of the Waywatcher whilst the Hearthguard attempted to take down the Prince... they didn't. Everything failed their charges and it went over to Adam. The Wanderers battalion allows them to shoot in the Hero phase if you get too close to the Nomad Prince, which the Griffin was. One shot from the Wayfinder was enough to bring him crushing down off the wall leaving the objective free to be claimed back. In the movement phase, the Wild Riders run across the board to attack the Luminark holding the bottom right objective, the Sisters moved in to charge the Vulkite closest to the Runefather whilst the Rangers moved up to attack the other flank of Vulkite. The Nomad Prince moved in to take the Altar back on his side. Another Volley of Shots took the Hearthguard down to 7 and all but deleted a unit of Vulkite, leaving just the Karl standing. On the other side the Glade Guard and Waywatcher took a few wounds off the Hurricanum. The Wild Riders made the charge into the Luminark, the Sisters into the 10 man unit of Vulkite and Rangers into the Vulkites on the other flank, the Glade Guard moved into the Hurricanum. 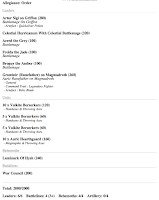 The fights were cagey, no one really doing significant damage to the other except, the single Karl who went into Beast mode and chopped down four Rangers before being bundled and murdered by them. A true Hero. After turn 2 the Story ended up moving another 12" towards Adams edge and it was all but over, he did not have enough Heroes in the correct places to be able to take the areas back. We played out turn 3 anyway though. Again I won priority, I used the War Council to unleash as much damage spells as they knew, the Hurrcanum took down a few Glade Guard, the Amber wizard took down a Sister, the other two failed to cast anything and then became befuddled on the mystical terrain. Most things were locked in combat, except the Runefather who swung round to charge the few remaining Glade Guard in combat with the Hurricanum. The Hearthguard moved up to shoot more at the Nomad Prince. 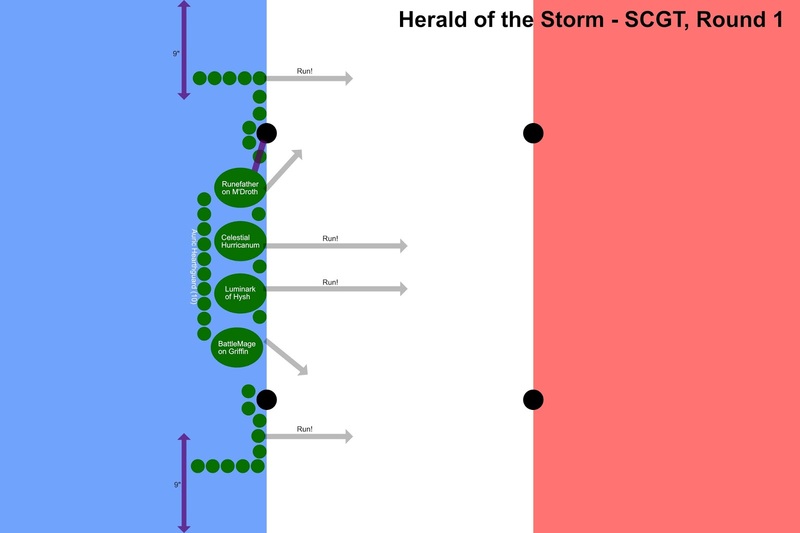 In the shooting phase, the Hearthguard failed to Kill the Prince, but the Hurricanum unleashed the Storm upon the Sisters and brought the remaining few down. The charge phase saw the Runefather hit the Glade Guard and went on to destroy them with his Latch Key weapon. The Luminark still held strong against the Wild Riders too. In Adams turn 3, he grabbed the bottom left altar with his Nomad Prince and took out the Grey Wizard, he also destroyed the remaining Hearthguard and killed them death by arrow storm. But in the end once again the Storm moved another 12" towards his edge and reached the end board edge. 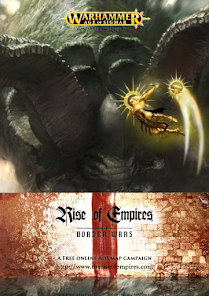 The War Council had made it through the Realm of Ghyran, fending off the Wanderer Host and getting into position to open the gate, where this gate led they did not know but the path they were on was the correct one. 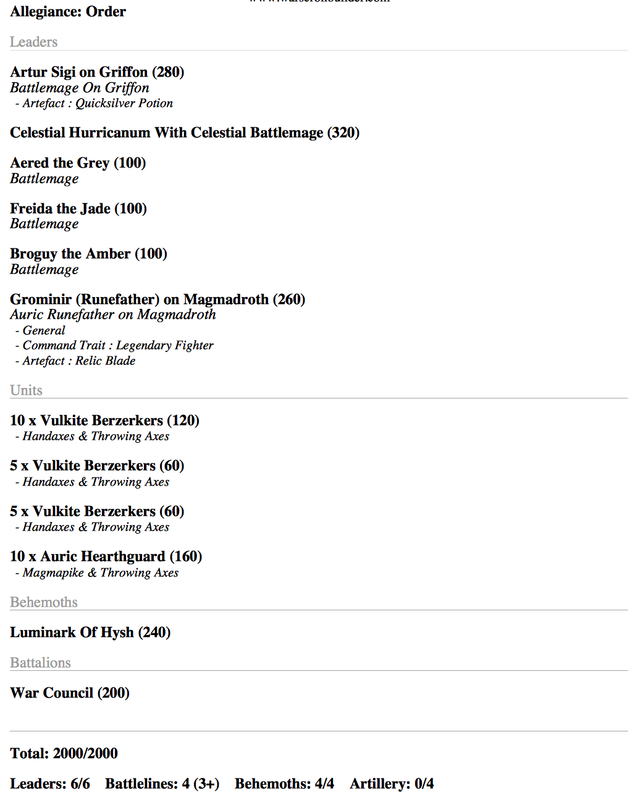 This was a great fun battleplan, one designed of course to have in your arsenal as many Leaders and Behemoths as you can. Luckily in my army I have 4 Behemoths and 6 Leaders, one thing we noticed and which Adam will definitely do differently next time, this mission does not lend itself to ambush rules. Because of the nature of how the objectives affect the game and the fact that you only need to tag the objective gaining the two in your first turn is probably a priority. He did not have enough room to in deployment to affect my middle grounds and could not properly deal with the four big targets. Where as if I was coming onto his territory and he had all his army there, he could have used a few rounds to shoot me down before reaching his objectives. We also found he should probably have at least one larger more wound model in his army and I believe he will try and fit in the Sisters on Dragon for his next game. All in all a good battleplan though, well thought out with the interaction between the objectives and the Storm line (adapted from the battleplan in Quest for Ghal Maraz, War of Storms). Chance to tell some great stories and a great introduction to the event.